Associated workshops will be held during the week 29 September-4 October; see the links below. 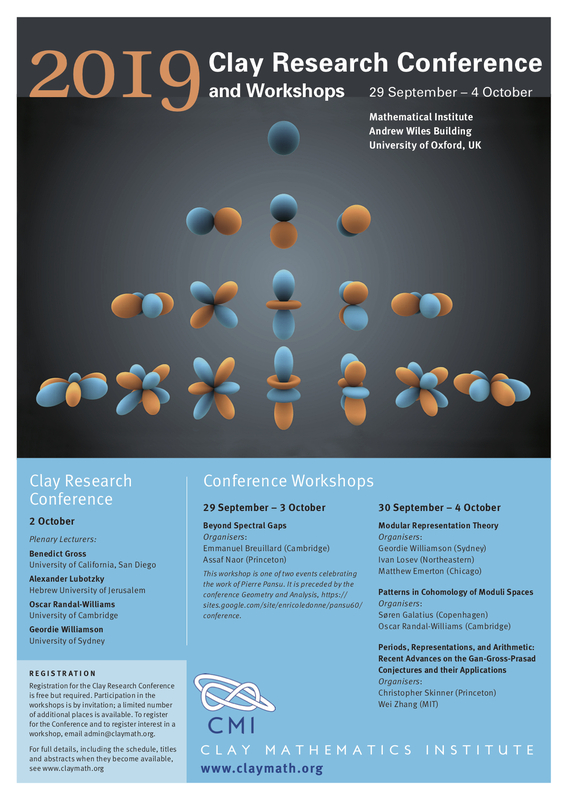 Registration for the Clay Research Conference is free but required. Participation in the workshops is by invitation, but a limited number of additional places is available. To register for the Clay Research Conference or to register interest in a workshop, please email Naomi Kraker, providing the name of your institutuion and stating which workshop you wish to attend. Students please also provide a letter of reference from your supervisor. HOTEL SCAM ALERT: Some speakers may be contacted via email or telephone by Business Management Team, Business Travel Management, or similar. Please be advised that we use no external organizing service. All emails regarding the conference or workshops will be sent by CMI or a workshop organizer. A number of conferences have been targeted, including MPIM who offer this advice.